Medicare is facing severe financial strains that threaten its future viability. On a per capita basis, Medicare spending is increasing at twice the rate of the gross domestic product, and, according to Medicare's chief actuary, the program is facing a breathtaking funding shortfall of $62 trillion -- nearly six times larger than the much -- discussed shortfall in Social Security. The newly enacted Medicare prescription drug benefit could cost more than $700 billion over the next 10 years and will only add to the program's financial woes. That new drug law would provide a sizable net benefit to retirees and older workers without existing coverage, even if Congress immediately funded it through higher Medicare payroll taxes.Workers born before 1965 -- baby boomers and current retirees -- would receive a net gain of about $20,000 per capita. Younger workers and all future generations, however, would suffer net losses of between $2,500 and $4,000 per capita. Furthermore, failure to include meaningful Medicare reforms in the drug program may cause steeper cost escalations, diluting its benefits. 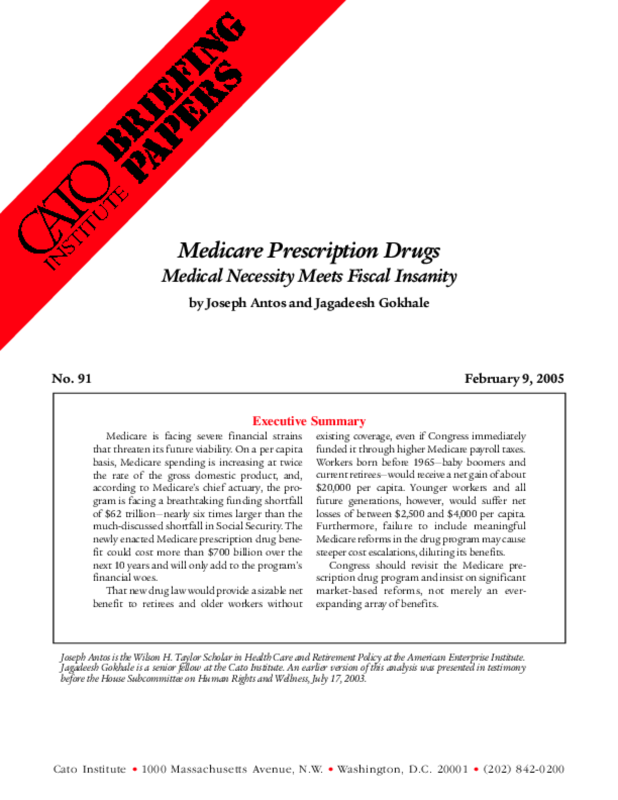 Congress should revisit the Medicare prescription drug program and insist on significant market-based reforms, not merely an ever-expanding array of benefits.